You tell them to clean up their room, do their homework, and before you know it, it's time to start thinking about driving. TUCSON, Ariz. - You tell them to clean up their room, do their homework, and before you know it, it's time to start thinking about driving. "I just kind of get nervous...the way some people can drive," says mother of soon-to-be teen driver, Cassandra Davidson. Chances are, if you're a parent, you share some of that same emotion. "Especially with road rage lately," says Davidson. "And sometimes she doesn't understand something and somebody gets upset and cuts her off. Or just drunk drivers especially." Unfortunately, the reality of teen driver fatalities in our state is a real thing. Case in point, a deadly crash in Pinal County just a few months ago. In fact, WalletHub released a study in June of 2018 that ranked Arizona the tenth worst state for teen drivers. But it's not just parents who are concerned. "You never know what can happen," says Davidson's daughter, Alexia. The bright-eyed 15-year-old is a few months short of her first solo-trip behind the wheel, and even though she's confident, Alexia says her newbie-status might not mesh with veteran-drivers. "I feel afraid if someone's like behind me and I'm driving too slow, like they'll get mad at me or something and it makes me, like, want to pick up like the speed, but I'm more of like a slow driver," says Alexia. Arizona is also one of a few states that doesn't have a law requiring a drivers education course. "I think it kind of stinks," says Davidson. "I wish they would do that a little bit more." So because of that, a lot of families chose to take the training into their own hands. "She's able to drive around town," says Davidson. "A lot of the drivers here understand because they all have young kids, so they understand. We also take her out into the desert a little bit." Distraction, as we know, is a huge concern for parents of teen drivers. "The phones have to be put away, of course," says Davidson. Especially when it's not just you in the car. "It's a huge responsibility," says Alexia. "I have to be responsible for people's lives in the car and the people around me. " "Just be careful. You hear so many stories of road rage and it's probably just a kid driving, or just learning how to drive," says Davidson. "If they're going slow, go around or move to the other lane." It's a good reminder to everyone that no matter the age, respect on the road is a key component in keeping everyone as safe as possible. The Arizona Department of Transportation says during the first six months of a teen getting their license, they can't drive between the hours of midnight and 5 a.m., unless they are with a parent in the front passenger seat. Also keep in mind, they aren't allowed to drive with more than one passenger under the age of 18 on a public highway unless the passengers are the driver's siblings, or there is a parent in the vehicle. 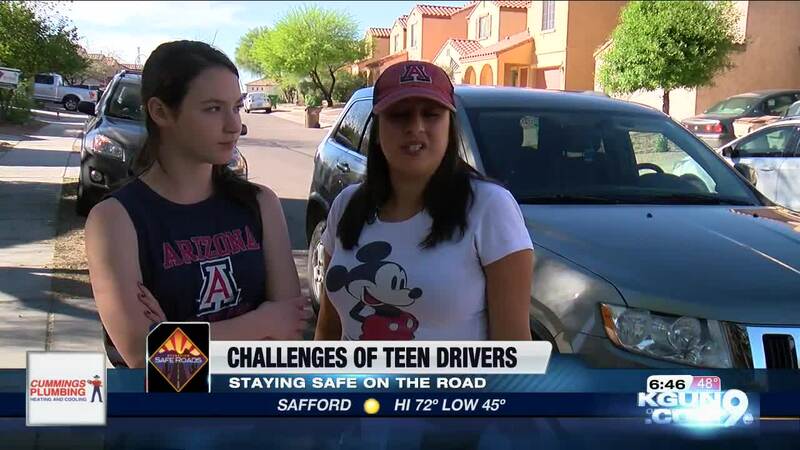 For more information from AZDOT on teen driving, click here.